Nature baby names are white hot. River and Willow, Ivy and Rowan, and many more names continue to gain in use among parents throughout the English-speaking world. But not every nature name is created equal. Some remain daring and rare, even as we forget that others have roots in all things green and growing. Some of the most traditional nature baby names fall into this category. Think Lily and Rose. But dozens of less traditional options come straight from the garden, too. For some daring flower names, check out this post. Swooning over these French flower names. And a few more. Le swoon. Bluebell is one of my guilty pleasures, found on this list. Tree names you’ve never thought of. My exhaustive list of tree names that you’ve probably come across. I love this list because it includes Panda. And another great list of animal-inspired options. Owls are my favorite, but there aren’t many names inspired by the birds. Speaking of birds, here’s my Great Big List of Bird Names. River and Brooke are the best known, but an awful lot of water-inspired names could wear well. Take today’s nature baby names trends, hop in your time machine, and you’ll have the Dictionary of Medieval Names from European Sources’ list of water-related names. Or just circle the globe to find the names on this list. Possibly the most comprehensive list of accessible water-inspired choices, thanks to The Art of Naming. To everything, turn, turn, turn. Seasonal names abound. Winter-inspired names, with a heavy dose of the winter and holiday seasons. I’ve written about Winter Boy Names and Winter Girl Names. The Art of Naming has a series devoted to the topic. 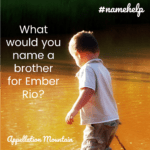 Start with Summer Names for Boys. While we’re talking summery names, I think this list of Beach Boy Names fits nicely. All of the seasons make an appearance on this list of weather-inspired nature names. Here’s my Ultimate List of Spring Baby Names – packed full of nature-related choices, too! I could probably add two dozens lists like these. We love all things celestial lately. A mix of the familiar and the forgotten in this list from the Dictionary of Medieval Names from European Sources. One of my most popular posts – ever! – is this list of night sky-inspired names for girls. I do love Twyla. I think this list of thirteen nature-inspired names hits the sweet spot between familiar and not-too-out-there. 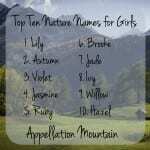 Advice about finding a great nature name for a daughter. On a similar note, this mom wanted two very unusual nature-inspired choices for her twins, sisters to Cedar and Juniper. Appropriately, Tulip By Any Name has a series of columns featuring nature names by letter of the alphabet. Start with A.
I’m not sure how wearable these French and Polish word name suggestions are in the US, but I’m intrigued. The most popular nature names for boys, circa 2017. Nancy has a girls’ list from the same era. One more little bit o’ everything list, because it has a few I hadn’t considered before. Hipster-folk names with a heavy dash of nature influence. I can’t decide if Hemlock is sheer genius, or downright bananas. Wide-open spaces make a great source of possibilities. 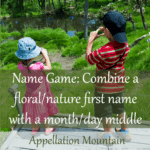 A great list of one-syllable nature names, many of which would be perfect for boys. 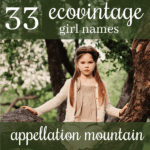 Ecovintage girl names, when you love antiques and the outdoors! Is Birdie the next big thing? It’s a little bit Max, a little bit X-Files: could Fox be the animal name that goes mainstream? Oh, I hope someone is brave enough to use Thalassa. I love the sci fi associations with River so much, I almost forget it’s a nature name. 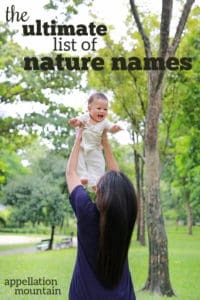 What are your favorite categories of nature baby names? Any great posts that belong on this list? Wondering if readers can weigh in on this one is Wren daughter of Lauren sweet? Or just too much? Also I do love Lark but my husband is Marc. Alice Bluebell is gorgeous, but oh, I love Viorica, too. You can’t go wrong! Bluebell is one of my guilty name pleasures. I have been trying to talk My husband into letting me use it as a middle name. I think it would be fitting to go with Alice, reminding me of my recent trip to Oxford where I saw bluebells everywhere while I visited many sites related to Alice in Wonderland. (I’m a fan of Alice in Wonderland). Unfortunately for me, my husband isn’t interested in Bluebell, but he says Viorica is allowed on possible names list for future children. It’s a Romanian name for bluebell. We’ll see!